"6:45am The Ivy. The day begins." Celebrated food writer A.A. Gill wrote this beautiful ode to the Ivy in 1999. It walks the reader through a day in its life peppering the story with its food (as recipes), with delicate introductions to each dish offering support, history, and tips. The food is simple, it's homey, it's beautiful. It's finally upon us! The launch party of The Ivy Brasserie here in our Fine City is tonight! We love the mystique and grandeur the Ivy brings to our streets, but, I couldn't put it better than in the words of A.A. Gill himself (in this very book): "The first time you eat in a restaurant there is a high insecurity rating. It's new territory... A new restaurant can be fun, but it's also stressful... You need to feel comfortable, and it's familiarity that breeds content. What everyone wants is to be a regular somewhere, to be greeted by name, to know which is the best claret, to feel that this is 'my place'. Eating is one of the three most basic instincts and, be it ever so chic and post-modern, a restaurant is a place where the diner must feel a fundamental sense of being childishly safe." 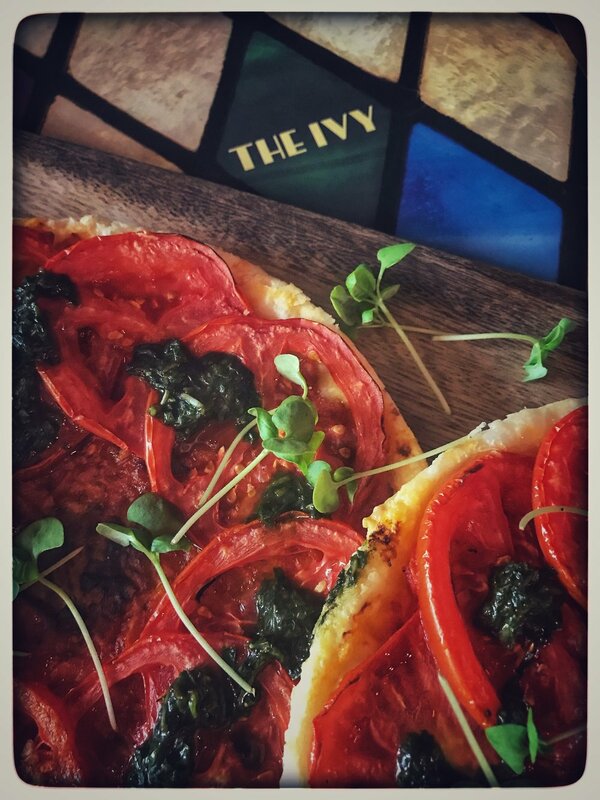 The Ivy name and brand holds a lot of clout, and we are so excited to have them opening the doors of their brasserie here. Because the words of A.A. Gill live in immortality for so many reasons, I've included the introduction he wrote to the recipe we're sharing here (below) because he shares a very truthful point: it never tastes quite as good as the restaurant. There's an advert (commercial, we call them in the USA) for a chicken broth called "Swanson" in the States- and it's got to be one of my favourite marketing campaigns of all time. It's a series of women sharing a recipe, but they just can't get it to the same standard as the original. There is something a little 'off'. Turns out (big applause here to this marketing director) it's because the broth needed to be Swanson broth. I love this campaign because it's so true to life. Recipes can give you context, suggestions, but change the type of tomato (we did- it's what we could find! ), use a different brand (try a few different puff pastries, for example), or use a different type of salt, brand of pepper, or change (insert ingredient here)... and watch your recipe morph. Top it off in a restaurant where professionally trained chefs season each dish to their palette- and it's going to change the outcome. The trick in a restaurant is to make it the same every. single. time. That's how to make their recipes work for you- try it differently until you get it 'right'. 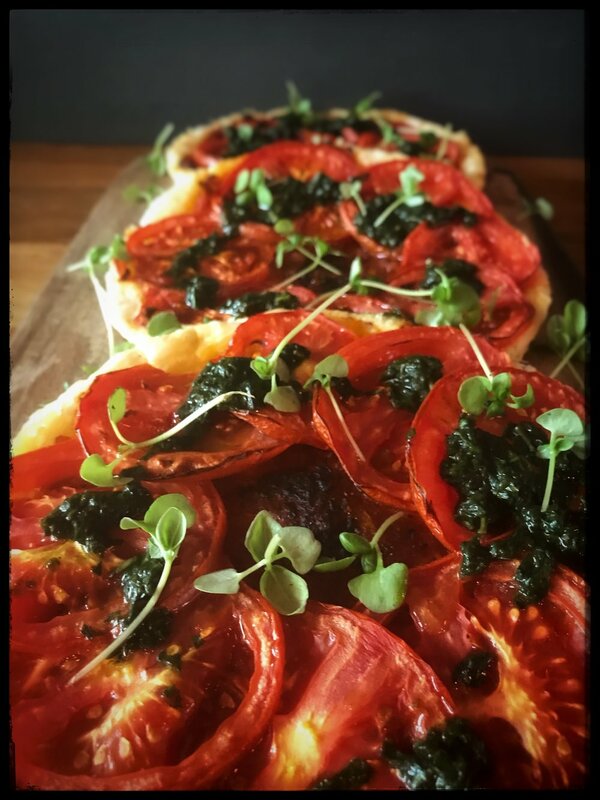 As the Swanson motto goes: "The recipe is not the recipe without Swanson"... and below, this Plum Tomato and Basil Galette is not the Plum Tomato and Basil Galette without the Ivy. But it's so simple and tasty, you may as well try!! Pre-heat the oven to 160C/gas mark 3. Prick the pastry bases with a fork and bake them for 5 minutes in the oven, turning them over after 2 minutes to ensure that the pastry does not rise (if it does it will form an uneven base). Turn the oven up to 200C/gas mark 6. Drain most of the oil from the sun-dried tomatoes. Then process with the tomato puree in a blender until a fine paste is achieved, then spoon it into a bowl. Wash the blender and then process the basil leaves with the olive oil. Add a little more oil if the dressing looks to thick. To assemble the galettes, spread a thin layer of the sun-dried tomato puree on the pastry bases. Lay the sliced tomato in a circle on the top, overlapping slightly. Season with freshly milled black pepper and bake for 8-10 minutes. Serve on a warm plate. Drizzle the Basil Dressing generously over the tomatoes and sprinkle with a pinch of rock salt. nb from Chef Jaime: I have no idea what the 200g basil is for listed under the tomato puree. Follow the 120g suggested for the dressing, but do keep some to sprinkle over the top. You can see in my version that I used micro-cress rather than full-size leaves, but either will taste delicious! further nb from Chef Jaime: Try this with cheese! Melted mozzarella, crumbled goats cheese, a bit of fried halloumi... it'll all taste good!